Today’s Icelandic horses are direct descendants of horses brought to Iceland by the Vikings over eleven centuries ago. As the trip was a harsh one in the Vikings’ traditional open boats they only chose the best stock to make the long journey. Realizing the need to keep out disease, in the year 900 Iceland passed a law that no new livestock, including horses, could be imported into the country. This also meant that any horses that left the country could never return to their homeland. This ancient law still stands today and is credited with making the Icelandic breed one of the purest in the world. 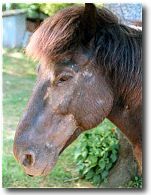 This law has also made many of the horse diseases we find so common here in the US completely unknown in Iceland. Right from the start the horse was an important part of Icelandic life. Bridges and roads only appeared in Iceland during the middle of the 20th century. Therefore, the horses were used for work and for transportation. In those days the horses were often known as "the bridges of Iceland" as it was often their job to safely get their riders to the opposite bank of Iceland’s many swift glacial rivers. By the 1940’s and 1950’s, roads and bridges became more common, and although the horse’s traditional role began to fade the horse never really lost its popularity. Today the Icelandic horse is held in high regard in its homeland as a horse for sport, recreation, and family. Travel on the horse is still often seen and next to most automobile roads in Iceland you will find a horse road as well. Probably the most beloved trait of the Icelandic horse is its unique character. Iceland has never had any predators large enough to be any threat to a horse, but instead is a country with tremendous environmental dangers, such as harsh extremes in weather, volcanic activity, extremely varied and treacherous terrain, quicksand, rock slides, rivers with changing currents, etc. Therefore, the ability to assess a situation rather than the instinct to flee has been central in the survival of the horse. Even today Icelandics seem to lack the “spookiness” of most other breeds and more inclined to think through a situation before making the decision to run. They also seem to have a much higher pain tolerance than other breeds and have a strong will to survive even the toughest conditions. There are many old Icelandic tales of horses that overcame tremendous obstacles to carry their riders safely to their destination. Icelandic horses also seem to have a strong homing instinct. Even in unfamiliar territory they always seem to know they way home(or back to the trailer) and usually can be relied upon to find the way even with a rider that is hopelessly lost. However, some Icelandics have also been known to try to go to what they believe is their home, even over great distances, when moved to a new place or after being purchased by a new owner. Traditionally in Iceland, young horses and those not under saddle were allowed to run free in large herds the highlands. Due to environmental concerns this practice only continues today in parts of Northern Iceland. However, even in other parts of Iceland the horses are often left in vast pastures largely on their own for long periods of time. All horses in Iceland are also given an annual vacation in late fall of each year where they can be in herds left alone. The Icelanders feel that it is important that the horse grows up learning how to be an independent thinker, to take care of itself, and to not be too dependant on humans. The Icelanders want their horses to be thinking partners. They also believe that horses allowed to run free at least part of the year grow stronger, become more sure footed, and are more self-confident. 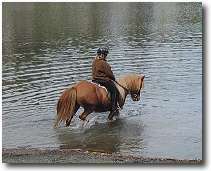 In general Icelandics are bred to be spirited under saddle. Almost all Icelandics tend to be very calm and easy going on the ground, but most will be surprisingly forward when ridden. Icelanders call this sprit "willingness" and a willing horse by Icelandic standards is a hot horse indeed. A willing horse will always offer more energy to the rider. However, as in all other breeds the amount of willingness varies from individual to individual some being very willing, others not. Some Icelandics even seem to have the talent to adapt to the skill level of the rider. Icelandic horses are extremely social and need to be around other horses for companionship. An Icelandic kept alone will quickly become depressed. Although, they do fine in the company of other breeds most clearly prefer their own kind. 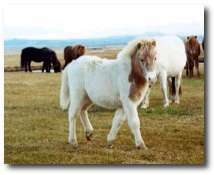 Even Icelandic stallions are usually either kept with a band of mares, or with geldings for company. In the early days the rugged Icelandic climate meant that keeping only the best horses was worthwhile. Cramped quarters meant that often people, horses, and other animals would all share tight spaces. Therefore, any horses that showed faults in character were quickly culled and used for meat. This practice continues today in Iceland and horsemeat is exported regularly to mainland Europe and Japan. It may sound very harsh, but this is probably the strongest reason why today you will rarely find an Icelandic that would ever kick, bite, or even lay its ears back at a human for any reason. This sort of behavior is simply not tolerated. Although some Icelandics are more friendly that others the majority enjoy the company of people and most Icelandics are known to form very close bonds with their owners. Icelandics tend to be extremely smart. As such they often learn new things very quickly. However, as they are bright they usually don’t like to be drilled and they must constantly be challenged with new and different tasks to stay interested and willing. Although Icelandics are sometimes schooled in a ring or on an oval track, most like to be trained out on the trail enjoying nature. The size of the Icelandic horse, generally ranging from 12 – 14 hands, is usually termed as pony sized here in the Untied States, however, as there is only one size equine in Iceland they are always referred to as horses. In addition, despite their small size, Icelandic horses are extremely strong. They are bred to carry adults and do so with ease. Remember these were the horses of the Vikings and the Vikings were not small people! 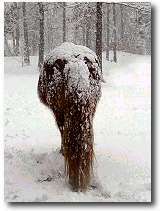 During the winter the horse develops and extremely thick and shaggy coat. This coat protects them both from the temperatures and from the precipitation that Iceland experiences almost on a daily basis. In the summer their coats shed out and the horse has the same sleek appearance of most other breeds, however, the mane and tail remain lush and full all year round. Icelandics kept in their natural state never need to be blanketed even in the coldest climates. In warmer climates, such as California or Florida clipping in the winter is a must. Shaped by their harsh environment the Icelandic horse much prefers to be outside as opposed to being stabled. Even if given the opportunity of shelter they will rarely use it and will be out in both rain and snow. Usually in the hot days of summer they appreciate a shelter to escape from the heat and bugs. One of the most noticeable attributes is the rainbow of colors that can be found in the breed. 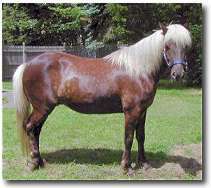 Icelandics are found in all color patters including, all different types of pinto, roan, silver dapple, dun, etc. They only colors you will not find are appaloosa and sabino pinto. The most common color is chestnut. Icelandics are generally not bred for color, however, many of the more beautiful colors are highly sought after. In general, Icelandics are extremely healthy and hardy. However, as their digestives systems have evolved to live on very little, many Icelandics can easily become obese without proper management. Founder can also be a concern if the horses are allowed to overeat. Most do well either with limited access to pasture, or good grass hay. Grain is not necessary for most individuals. In addition, some imported Icelandics suffer from summer eczema, which is an allergy to the bite of gnats. Studies have shown that approximately 30% of all imported Icelandics are affected, although only in areas where the offending insects can be found. The allergic reaction can cause intense itching which can lead to open sores, some of which may even become infected. The most commonly affected areas are the belly mid-line, head, mane, and base of the tail. 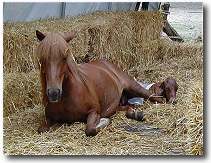 Often horses with summer eczema will complete scratch out their manes and tails. Sadly, at this time there is no complete cure for summer eczema. However, it can be dealt with best through the use of a blanket called the Boett Pajama which blocks the gnats from biting the horse. In extreme cases use of steroids can also ease the symptoms. In addition to the gaits all horses have, walk, trot, canter/gallop the Icelandic is the only truly five gaited horse in the world. In addition to these basic gaits the Icelandic can also perform the tolt, and some Icelandics can perform the flying pace. 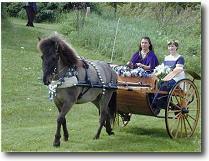 The tolt is a four beat gait similar to the rack of many of the more common gaited breeds in the US. It has the same footfall as the walk, but is performed at faster speeds. A good tolt horse can tolt almost as slowly as walking up to as fast as a gallop with all speeds inbetween. It is a very smooth gait because it does not have any suspension phase, which means that the horse always has at least one foot on the ground. Ideally, the tolt should be supple and graceful with good undereach of the hind legs and good lift of the front legs. 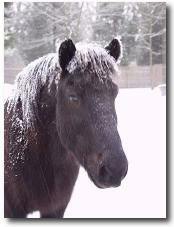 Some horses are “natural tolters” which means that they prefer tolt over other gaits. Other horses have to be asked to tolt and take a bit more experience to ride. The flying pace is considered the prize of horsemanship in Iceland. It is a slightly four beat gait (very close to two beat) that is similar to the pace of a Standardbred, but as it is very smooth it is ridden. It is a racing gait and only performed at top speed. 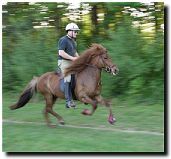 Good pace horses can top speeds of 35 mph! Pace races are very exciting events to watch. Not all horses posses the flying pace. 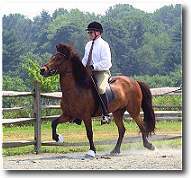 Those that have the gait are referred to as five gaited horses. Those that don’t are referred to as four gaited horses. Although the breeding goal in Iceland is for the perfect five gaited horse, in reality four gaited horses are no less prized and many people even prefer them to five gaited horses. Icelandic horses are naturally gaited. 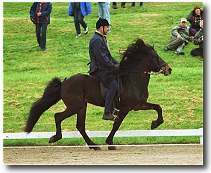 Training by artificial methods such as extreme shoeing and weights is condemned by all Icelandic horse breed associations around the world. Icelandics horses are shown in special Icelandic horse sport competitions. These shows have various classes in which the clarity of gait and the quality of the horse’s different gaits is judged, usually on an oval track. Use of extreme weights or shoeing is prohibited by strict rules and the natural abilities of the horse are celebrated. Currently, only a few shows for Icelandics exist in the US, but interest in Icelandic sport competition is growing and thus the number of shows and attendance at them increases each year. Unlike many other breeds in the US, you won’t find any Icelandics that are “just” show horses. 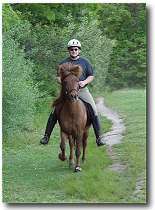 Any Icelandic trainer worth their salt trains their horses as much out on the trail as on the track and almost all Icelandics used for show spend most of their time as pleasure riding mounts for their owners. Icelandic horses are traditionally ridden in what we would probably call here in the US as “English” style of riding. Icelandic tack usually focuses on simplicity and comfort. Most Icelandics are ridden in snaffle bits with quite a minimal bridle with a drop-noseband. The Icelandic saddles are usually ones made for comfort for both horse and rider. Saddles are usually placed a bit farther back than is normally seen here in the US to allow the horse freedom of the shoulder. However, the saddle must not be so far back that it impedes on the horse’s loins. Although Icelandics can be ridden in other kinds of tack it is important to get a proper fit and understand the impact certain tack may have on the gaiting ability of the horse. Icelandics, bred to be an all purpose horse, are incredibly versatile. Because of their good movements, willing attitudes, and ability to learn quickly some do well in the dressage. Their strong hindquarters make some excellent jumpers and around the US some Icelandics are used for fox hunting and for three-day eventing. Their quickness makes them good at gymkhana and other speed games. Some are used for driving where their level heads and strong bodies do well. Some also show their great hardiness and stamina by successfully competing at top levels in endurance. Yet others use their gentle nature and smooth gaits to help disabled riders. And of course many fill the role of the all purpose family horse. Breeding Icelandics is quite an art. 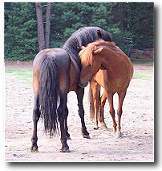 With four and five gaits combining individuals to produce good offspring is not as easy as it is with many of the traditional three gaited breeds. 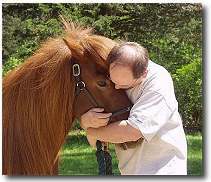 As a guide, most breeding horses are brought to evaluations to have their qualities assessed. At these evaluations both the conformation and riding characteristics of the horse are judged. The scores for each attribute ranges from 5.0 (not shown – a four gaited horse will always receive a 5.0 for pace) to 10.0 (near perfect). Horses that reach total scores over 8.0 are considered "first prize" and of very high quality. However, it is also important to look at the individual scores to get a complete picture of the horse. 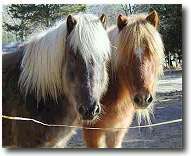 All such activities, such as breeding, sport, registration are strictly regulated by the international association of friends of the Icelandic horse called FEIF.